As of the time of this writing, the company is only $25,000 away from its goal. Tim Schafer is a name well known by adventure game fans. He, along with Ron Gilbert, created 'The Secret of Monkey Island.' 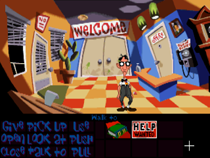 He's also the man behind 'Full Throttle,' 'Grim Fandango' and 'Maniac Mansion: Day of the Tentacle.' So when Schafer announced that he was working on a new point-and-click adventure game, people got excited. Schafer and Double Fine announced the new game yesterday afternoon, when they also revealed that funding would be coming directly from money raised on Kickstarter. The plan is to raise $400,000 of which $300,000 will be used to fund the game. The other $100,000 will go to documenting the creative process and releasing monthly videos to show how things are going. Those backing the project will also get access to a special community where they can talk to developers as well as a beta version of the game when it launches. Assuming you shell out $15 or more, you'll get a copy of the full version as well. Since the announcement of the Kickstarter campaign yesterday evening, Double Fine has raised $375,000, just out of reach of the goal. That's at the time of this writing of course - 5:00am, don't ask why - and funding will run until Tuesday, March 13th. There's no doubt that Double Fine will not only meet but exceed the amount of money needed for the project. The Kickstarter FAQ answers the question of where that extra cash will go. "The extra money will be put back into the game and documentary. This could result in anything from increased VO and music budgets to additional release platforms for the game." If numbers keep growing like they are now, we should be able to expect very big things from this game indeed.